How to buy the most reliable MDMA (Ecstasy/Molly) test kits of 2019 to test for identification, purity, and cuts. When you’re about to take a drug, do you ever wonder what it’s been cut with, how pure it is, or if it’s even the actual drug you think you’re taking – or just a cheap substitute? Some people simply take a drug and wait to find out, but with the number of nasty ingredients commonly being used to cut drugs, this is a strategy that could have a nasty outcome. A better solution is take the time to use a test kit to find out what your drugs contain. When it comes to ecstasy or molly, MDMA test kits can answer all of your questions in a matter of minutes. MDMA purity test kits tell you how much MDMA is actually in a sample, MDMA identification test kits will simply tell you if there’s any MDMA in there at all, while MDMA cuts test kits let you know what other drugs or chemicals might be lurking in that little baggie. Keep reading on to learn about the best MDMA test kits and how to use them properly. You’ll also learn why it’s a good idea to buy ecstasy/molly test kits and have them on hand with the counterfeit drug scene being what it is in 2019. First, let’s briefly discuss the different types of MDMA test kits and what each one does. The simple answer to “Which one do I need?” is “Multiple ones.” You see, each ecstasy test kit only gives you once piece of the puzzle. That’s why it’s best to use a variety of tests to get a complete picture of what you’re taking. That way, you’ll know exactly what’s in your sample, as well as how pure it is. Here is a quick rundown the tests you’ll be using before we move on to reviews of the best ones to buy. So your Marquis test picked up MDMA in your sample of molly. Congratulations! But how pure is the sample – how much MDMA does it really contain? A MDMA/Ecstasy purity test kit will let you know quickly so that you’re not wasting money on drugs that have been cut down to nothing. If your dealer says it’s high-quality stuff, this MDMA test kit will help verify that. Knowing how pure your stuff is will also help you dose safely and responsibly. There are different types of MDMA identification test kits, and each one of them tests for a different spectrum of substances. You can use these tests in combination with each other to narrow down what ingredients are present in a piece of pill or sample of powder. Marquis: For those who are unfamiliar with how to test molly, a Marquis reagent test kit is a great starting point and is a must-buy for anyone who wants to educate themselves about what’s in their drugs. This type of kit looks for MDMA-type ingredients, as well as substances such as speed, DXM, MDPV, 2C-B, and others. If your Marquis tests turns purple to black, you can use a Folin test to determine whether the sample contains MDMA, MDA, or MDE. Mecke: This test looks for opiates, as well as 2c-T-x compounds. 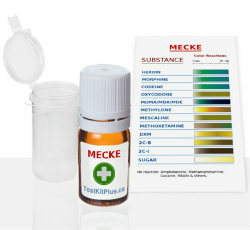 While the Marquis test produces somewhat similar colors for DXM and MDMA-like substances, the Mecke test clearly distinguishes between these ingredients with two clearly different colors. Mandelin: PMA and PMMA are dangerous – and they’re also common adulterants that are sold as pure MDMA. That makes a Mandelin reagent test a useful addition to any molly test kit. It also looks for MDxx, amphetamines, certain opiates, and 2C-type substances. Folin: Use this test to look for the presence of pierazines such as TFMPP and BZP in your sample. 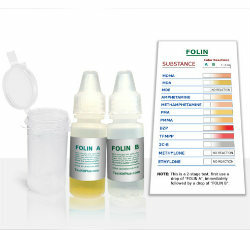 A Folin test can also distinguish between MDMA, MDA, and MDE. Why does this matter? While the three are from the same family of drugs, there are variations in their effects as well as how long they last. MDA often lasts longer, is much more stimulating, and features more hallucinogenic effects than MDMA. Meanwhile, MDE is milder than MDMA and much less stimulating. MDMA Test Kit Bundles: Because using several MDMA test kits together is the best way to get a full understanding of what you’re taking, most reputable companies sell MDMA test kit bundles. This is a great way to cover all of your bases. You can then buy individual test kits to take care of any substance not covered in your bundle, as well as in order to replenish low supplies of testing fluid in your current bundle as 2019 wears on. In addition to being the easiest way to purchase multiple test kits, this is also the most cost-effective way to shop for molly test kits. If you’ve ever taken something you thought was ecstasy, only to have no reaction (or even worse – a bad reaction) to it, then what you took probably contained little to no MDMA. Manufacturers often cut their product to make even higher profits. This isn’t just disappointing; it could be dangerous. An ecstasy cuts test kit can provide specifics about what’s in your sample. From MCPP and benzodiazepines to substances like TfMPP and 6-APB, this type of ecstasy test kit will help you rule out any unwanted cutting agents. Now that you have an idea of the way each type of MDMA test kit works, let’s move on to which ones you should buy. There are many drug test kit options on the market these days, but when the stakes are this high, reliability is important. That means it’s essential to only purchase pill test kits from brands that are reputable and make products that are known for their accuracy. Ease of use is also key; if the instructions for a molly test kit are too confusing to conduct the test properly, the likelihood of a bad reading is greatly increased. Read on for reviews of the best ecstasy/molly test kits of 2019! 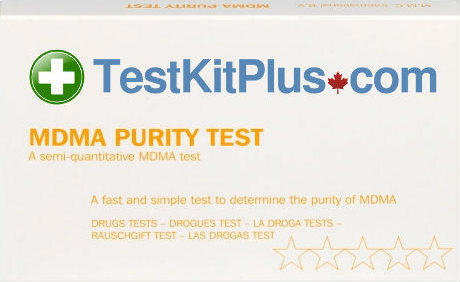 The first category of MDMA test kit reviews features MDMA purity tests. These will give you an idea of just how much MDMA is in your sample. No color change is a warning that the substance in question is likely not MDMA at all, while a very strong color change indicates pure and potent MDMA. 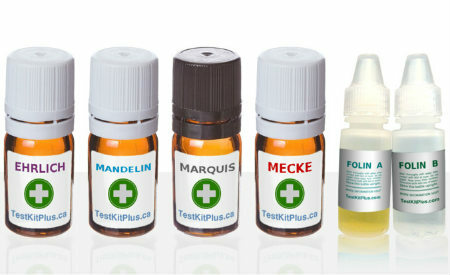 Based in Canada, TestKitPlus sells a line of highly professional drug testing kits that are also easy to use. They also feature lots of highly helpful information on their website and they ship all of their products worldwide in discreet packaging. That’s why they’re a reputable source for MDMA test kits, as well as other drug test kits. The TestKitPlus MDMA (Ecstasy/Molly) purity test kit simply changes color based on the MDMA content of any sample you place in the test ampoule. Light yellow indicates a very low MDMA content, while an amber or brown color indicates high MDMA content. This test has the added plus of changing colors if it detects substances such as benzocaine, paracetamol, TFMPP, and others. The test only requires 20 mg of a sample (add any more than that and the test may be skewed). Simply compare the lower level of color in the test ampoule with the included results chart to determine if there’s MDMA in your sample – and if so, at what levels. Each package comes with supplies for 10 ecstasy tests. The various identification test kits will help you determine exactly what sort of substances are in your drug sample. Because each MDMA test kit only looks for specific substances, it’s highly recommended to use a few of these in combination with each other to make sure you know exactly what you’re about to ingest. 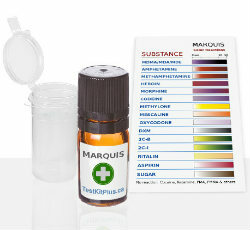 The most popular MDMA test kits for substance identification, a Marquis test kit is a great place to start. Here are the ones that are most highly recommended. In their Marquis MDMA test kit, TestKitPlus not only gives you a way to accurately test for MDMA/MDA/MDE, but they also allow you to test for other ingredients commonly found in pills and powders posing as ecstasy/molly. The Marquis test will react to Amphetamine, Methamphetamine, Heroin, Morphine, Codeine, Methylone, Mescaline, Oxycodone, DXM, 2C-B, 2C-I, Ritalin, Aspirin, and Sugar. TestKitPlus notes that while the result colors for MDMA-like substances and DXM are quite similar, the results for DXM will appear more gradually, while MDMA will cause an immediate reaction. If you’re still unsure, conduct a Mecke test to be 100% certain. Each TestKitPlus Marquis MDMA (Ecstasy/Molly) Test Kit comes with a bottle of testing fluid, a multi-use testing vial, and a results color chart. It’s a great test to buy if you frequently need to test samples of drugs. This test is easy to use, as well; simply place a small amount into the testing vial, then add a couple of drops of testing liquid. The color change should happen within 30 to 60 seconds. One of the things customers most like about many of the products from TestKitPlus is that they come with a reusable testing vial and a bottle of testing solution. This means that with one purchase, you have supplies to conduct dozens of tests, which is much less wasteful and more affordable than purchasing individual pill testing kits. All of TestKitPlus’s drug identification tests come in two sizes. Their regular bottle has enough fluid for 40 to 50 tests, while their large bottle has enough fluid for 80 to 100 tests. Everything is compact enough to be taken on the go for testing at festivals, clubs, or anywhere. Because the results for DXM and MDMA-like substances yield very similar colors when using the Marquis test, it’s best to follow up with a Mecke test – especially if the result resembles a dark purple or black. Here are the best Mecke ecstasy test kits to keep on hand. TestKitPlus Opiates/MDMA Mecke Test not only clearly differentiates between MDMA-like ingredients and dangerous DXM, it also test for the presence of opiates such as heroin, morphine, and codeine. The Mecke test will also reveal the presence of oxycodone, methylone, mescaline, methoxetamine, 2C-B, 2C-I, and sugar in any sample. Similar to the other TestKitPlus tests, this MDMA testing kit comes with a bottle of testing fluid, a multi-use testing vial, and a colored results chart. If the test picks up MDMA, MDA, or MDE, the fluid will quickly turn from green to a dark blue/black. If your Marquis or Mecke test has confirmed the presence of an MDMA-like substance, but you want to narrow it down to find out exactly what substance, the Folin test should be your next step. Folin tests react differently to MDMA, MDA, and MDE (for which they produce no reaction at all). They’ll also reveal the presence of amphetamines, dangerous PMA/PMMA, and more. The TestKitPlus Folin Test Kit comes with a multi-use vial and two different bottles of testing solution. Once you place a sample in the vial, drop one drop of the bottle marked “Folin A,” followed by one drop from the bottle marked “Folin B.” Results will take 1 to 2 minutes to develop. If your sample has yielded an MDMA-type result with a Marquis, Mandelin, or Mecke test and turns a pink/salmon color after conducting the Folin, there’s a high certainty that it contains MDMA. The Folin test will turn dark yellow if it detects MDA and will not react to MDE. It’s important to combine this test with a Marquis, Mandelin, or Mecke test to be sure of the results. This test also picks up the presence of piperazines (substances that do not cause a reaction on a Marquis, Mandelin, or Mecke test). These include substances such as BZP. Developed for use in fighting parasitic infections and often used as a pig wormer, piperazines are nasty ingredients that people do not want in their molly. Another kit to use after the Marquis and/or Mecke tests, the Mandelin drug testing kit, the Mandelin test looks for the presence of MDMA-like ingredients, ketamine, PMA, as well as other substances such as methoxetamine (MXE). Keep in mind that Mandelin reagent fluid is naturally a bright yellow color. No matter what test you use, to be sure you’re getting accurate results make sure you shake the vial thoroughly to mix the testing fluid and the sample. While TestKitPlus recommends testing on a white ceramic plate to more clearly see any resulting color change, their multi-use vial is convenient for testing on the go. It (and the bottle of testing fluid) provides you with the ability to always have the proper supplies on hand to test any sample. 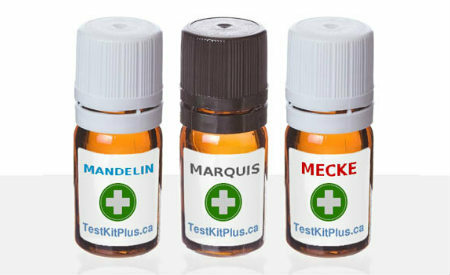 Like the Folin test, TestKitPlus suggests using their Ketamine/PMA/MDMA Mandelin test kit in combination with others such as the Marquis and Mecke tests. After you place a sample in the vial and put in a drop of testing fluid, results will appear in 30 to 60 seconds (with some substances such as ketamine reacting within just a few seconds). Pills or powders sold as ecstasy and molly frequently aren’t pure and have additional ingredients in them that can cause a different sort of high than you’re expecting. Sometimes, though, ecstasy is cut with additional ingredients that can cause unpleasant or even dangerous effects – and MDMA/ecstasy cuts test kits are a good final step in ruling these ingredients out. 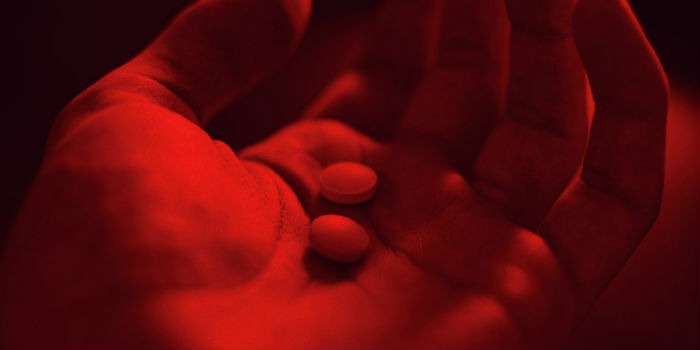 While benzodiazepines such as diazepam are valued for their own individual effects, dealers quite often pass off benzos as ecstasy – and charge the prices to match their claims. 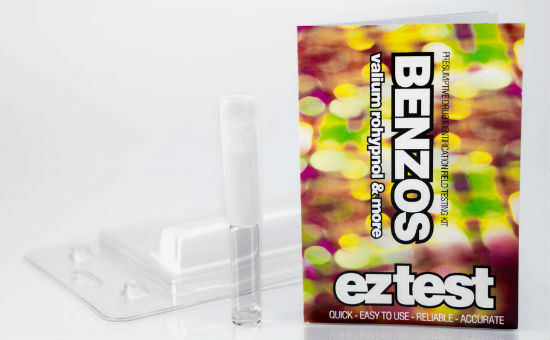 If your sample has turned up negative for MDMA and other ingredients, a Benzos Drug Testing Kit can confirm if the tablet you’re holding is a Valium instead of ecstasy. This test reacts in the presence of drugs such as diazepam, flunitrazepam (Rohypnol), nitrazepam, and flurazepam. Buy a single-pack test for a one-time test in EZTestKit’s easy-to-use ampoule. If you need multiples, their 10-pack is a better value per test. Because your safest bet is to conduct multiple tests on any substance you’re thinking about taking, drug test kit bundles offer a more affordable option than buying them individually. Here are the best ecstasy and molly test kit bundles on the market in 2019. The Essential Drug Test Kit (3-In-1 Bundle) includes bottles of testing fluid to conduct Mandelin, Marquis, and Mecke tests, as well as 3 multi-use testing vials. This is a much more affordable option than purchasing each test individually. You’ll still need to top off your collection by purchasing a purity or Folin test (if you desire) separately, or moving on to the larger 5-in-1 Bundle. Minus a purity test, The Complete Drug Test Kit (5-in-1 Bundle) covers all of the bases. It includes Marquis, Mandelin, Mecke, and Folin tests, as well as an Erlich test that looks for LSD and other indoles. With all of these testing fluids at hand (as well as a separate testing vial for each), you’ll be able to determine exactly what you’re dealing with (or have been dealt). Why Are MDMA Test Kits Useful? After you’ve already spent your hard-earned money on drugs, you may be hesitant to spend even more money to buy supplies to test them. One reason to invest in MDMA test kits is to hold your dealer accountable and learn who’s trustworthy and who isn’t. Sure; you’ll still get a high if the stuff you take is a benzo or ketamine instead of ecstasy, but if you wanted those, you’d have asked for them, right? Using ecstasy test kits is an good way to make sure you get the kind of high you expect and that you’re not popping some random drug. Another reason to buy ecstasy and molly test kits is that they could save your life or the life of one of your friends. It’s one thing to get a high that’s a bit different than the one you wanted and another thing entirely to end up in the hospital with a life-threatening reaction. 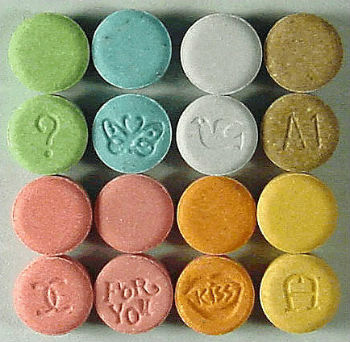 The reality is that today’s drugs posing as high-quality ecstasy and molly frequently contain DXM (which can cause heat stroke if taken while dancing), PMA (which can also cause heat stroke and is easy to overdose on because it takes a while to kick in), as well as piperazines such as BZP that can cause dizziness, anxiety, and even seizures. At best, unintentionally taking these can make for an unpleasant evening. At worst, the results can be deadly. To understand the dangers involved with ingesting ecstasy imposters, it helps how these different substances affect the body. Since you buy MDMA test kits to make sure a substance actually has MDMA, let’s start with that ingredient first. If you have a clear understanding of what MDMA should do when it’s present in the body, you’ll better be able to understand the undesirable effects of the cuts and substitutes we’re hoping to rule out. Whether you call it molly or ecstasy, MDMA (or 3,4-methylenedioxymethamphetamine for you scientists out there) is the actual ingredient that’s behind these slang terms. When you take MDMA, it affects the neurotransmitters in your brain, causing them to release serotonin. This makes you feel relaxed and euphoric. It also increases your sense of sight, sound, smell, as well as touch. MDMA makes you seek out physical and verbal contact with others and sends your feel-good emotions skyrocketing. The high usually kicks in about 90 minutes after taking MDMA and it can last for up to 6 hours. MDMA can make you extremely sensitive to light, can cause jaw-clenching and muscle tension, and can also cause you to have chills, sweat, or even feel faint. People taking MDMA have to be especially cautious about hyperthermia (overheating) or dehydration, as these are two dangerous side effects. If you’re getting pure MDMA, you may have a pretty good idea of what to expect from the drug and how it will affect you. Problems arise when you get a powder or pill that contains little to no MDMA. That’s why molly test kits are so helpful. Here are some of the substances to watch out for and how they can affect your body. DXM, or dextromethorphan, is the ingredient commonly found in over-the-counter cough suppressants. It works as a dissociative anesthetic such as PCP or ketamine, which means that it works as a stimulant that can give you a buzzed-up high. DXM can also cause hallucinations, as well as nausea and itchy skin. The real danger with taking DXM that’s posing as MDMA is that DXM runs an even higher risk than molly of causing heatstroke. This is particularly concerning in dance environments where ecstasy is often taken. Consuming DXM and MDMA together is incredibly dangerous, as both chemicals are metabolized by the same liver enzyme, which means that if you take them at the same time, your liver may not be able to handle them (elevating your risk of heatstroke even more). When people skip using a pill testing kit, they run the risk of ingesting adulterants such as DXM or PMA instead of molly. PMA is another common ingredient that gets substituted for or cut into MDMA. For years, it’s dominated the headlines, killing countless clubgoers by causing unintentional overdoses after they consumed what they thought was pure ecstasy. Without using a molly drug testing kit, it can be difficult to know if you’re taking PMA or PMAA because their effects are similar to those of MDMA. You’ll get the same euphoric high – just not as great. Your body temperature will increase and you may experience hallucinations. The dangers of PMA are twofold: it takes longer to kick in and it’s toxic at a much lower dose than MDMA. This means that people often take one dose of PMA (thinking that it’s molly), don’t feel it kick in within an hour or so, and take a second dose. This can send your body temperature and heart rate shooting up, create breathing problems, or even cause convulsions. The issue with adulterants like DXM and PMA is there is no visual way to tell if a pill has been cut with them. Using a drug testing kit only takes a few minutes and can help prevent unwanted side effects or death due to ingestion of these types of substances. Taking drugs that have been substituted for MDMA can be dangerous, but so can combining MDMA with substances that are commonly used as adulterants. Two of these are BZP and benzodiazepines. BZP is a piperazine – an ingredient commonly used to get rid of parasites in livestock. If you can get past its use as a cattle dewormer, BZP does create a high that’s very similar to taking amphetamines, and many users say it makes them feel the same as taking DXM. Its effects are very much like those of MDMA; it causes euphoria, heightened mood and senses, the desire to socialize and dance, as well as light sensitivity, jaw-clenching, and flushing. Although BZP can cause serious side effects such as kidney failure when it’s taken alone, when mixed with MDMA, it’s particularly deadly. The main concern is that the combination can cause the heart to function abnormally – beating with extremely forceful contractions that can cause the heart to give out, resulting in death. Benzodiazepines such as Valium cause relaxation and mild to moderate euphoria, as well as a reduction in feelings of anxiety. They can also cause drowsiness and dizziness, and if taken regularly, can cause addiction. Taking benzos and MDMA together is risky because the “downer” effects of the benzos can cancel out the stimulant effects of the MDMA, causing you to overdose. This is especially dangerous if MDMA has been cut with a benzo before it was pressed into a tablet. These are only a few of the ingredients that are commonly cut into or passed off as MDMA, but you can clearly see how not using MDMA/ecstasy testing kits can result in a really bad trip – or even a trip to the hospital. Because the manufacturing and sale of these drugs is illegal and unregulated, if you’re going to use, you have to take responsibility for your own health and safety. Drug test kits are the perfect way to have a more controlled, safe experience. 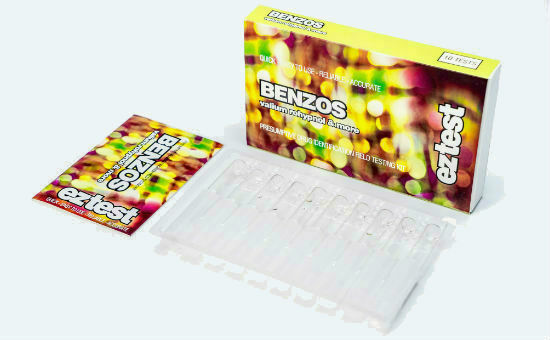 Molly testing kits can help prevent the dangerous combination of MDMA with drugs like BZP and benzodiazepines. The sharp increase of hospitalizations and deaths due to fake MDMA and other drugs has authorities issuing warnings and harm reduction organizations scrambling to educate people about the importance of substance testing. From Florida to Fiji, emergency rooms are seeing scores of people who have unintentionally ingested dangerous adulterants such as PMA as police are raiding the labs of manufacturers who are flooding the market with fake drugs. Even when someone gets a pill that contains real ecstasy, what they’re typically receiving features a small portion of actual MDMA. Typically, it’s mixed with stimulant ingredients known as synthetic cathinones. These can include substances known as “bath salts” (methylone, butylone and ethylone) which are highly dangerous and feature effects that closely mimic those of MDMA. People hoping to ingest pure MDMA often end up ingesting ketamine, a highly addictive tranquilizer, as well as methamphetamine, a controversial drug in its own right. An increasing number of deaths are occurring as a result of MDMA that’s been substituted or laced with PMA or PMMA. In fact, the latter ingredients are so dangerous that they’ve been nicknamed “Dr Death” and have triggered multiple warnings for clubgoers at risk of accidentally ingesting it. Another disturbing ingredient that’s showing up in drugs across the U.S. and around the world is alpha-PVP. More commonly known as flakka, it’s been nicknamed “the Florida zombie drug” due to one infamous incident in which an individual who was high on it removed his clothes and attacked another man, gnawing on his face until he was finally gunned down by law enforcement. Often imported from China, flakka has become a dangerous drug epidemic, especially given that it’s cheap enough to be used as an adulterant for other drugs. Now That You Know, Make Sure You’re Prepared! After reading up on the best MDMA test kits of 2019, there’s no excuse not to stock up and test away. Accuracy and user-friendliness are essential, which is why MDMA/ecstasy test kits from TestKitPlus have developed such a positive reputation. TestKitsPlus is a highly reputable company founded with the mission of promoting harm reduction among recreational drug users. Their molly test kits are professional, laboratory-quality products. While no pill testing kit is 100 percent accurate, this kind of high quality goes far in providing huge peace of mind. For easy reference, all of the MDMA/ecstasy test kits mentioned in this review are listed below – and all of them ship everywhere around the globe. Whether you stick to a basic MDMA identification or purity test or opt for a more extensive set of tests, empowering yourself with the knowledge gained through using ecstasy test kits is truly the safe and responsible choice. EZ-Test Benzodiazepines Cuts Test Kit – Valium, Rohypnol (Flunitrazepam), Nitrazepam & Flurazepam. 10 Tests per Pack.